Bhojaprabandha (narrative of Bhoja), written by Ballala Deva, is the story of Bhoja, King of Malwa during the 11th Century A.D. This book contains many interesting legends about great poets like Kalidasa, Bhavabhuti and Bana. Ballala Deva, it seems, was interested not so much in history as in heroics. In his attempt to magnify Bhoja as a patron of art and letters, Ballala has ignored historical facts. The poets, Kalidasa, Bhavabhuti and Bana, who, he said adorned Bhoja-s court, belonged to centuries much before Bhoja. This is an adapted version of Ballaladeva’s Bhoja Prabandha in Hindi. The author has retained all the interesting anecdots from the original Bhojaprabandha. May I get a copy of this book? If so, pl give me the address. 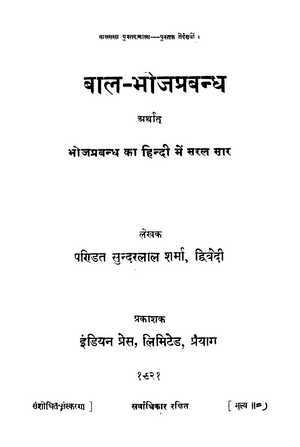 pl also inform whether sanskrit-Marathi version is available? I could not locate a Marathi version of this book anywhere on the net. Please see the download links given at the bottom of the post, from where you could download all the 3 versions of Bhojaprabandha. You may be able to purchase a hard copy of this book from Moti Lal Benarsi Dass. BHOJARAJA SARITHIRAM., 1990050051278. PUNNAI MADABOOSI-SRINIVASASI. 1902. tamil. BHOJARAJA SARITHIRAM. 86 pgs. booja charitthiram., 2990100189178. t’i.es. n-aaraayand-achaasthiriyaar. 1907. tamil. Drama. 512 pgs. boojacharittiram., 2990100189179. t’i.es.n-aaraayand-achaastiriyaar. 1900. tamil. Drama. 402 pgs. boojacharittiram muunr’aam patippu., 2990100189180. t’i.es.n-aaraayand-achaastiriyaar. 1916. tamil. Drama. 584 pgs. Please note how the titles are spelled in DLI entries. To download books from DLI, you may make use of a free software called DLI Downloader which can be found through Google search. I am not sure if its reprints are available now. I have not seen this book. Nor is it available as ebook. I read in maharishi dayanada’s satyarth prakash that in the time of king bhoja few of shilpkars made a horse like vimana. i search but i didnt find that shloka? Bhojaprabandha is only a collection of stories. You cannot find any scientific information in it. You can look into “Samarangana Sutradhara” by Bhoja, which is available at Digital Library of India. ok sir.. thank you. bytheway i was looking for this info mentioned somewhere in Bhoja Prabandha. This is very helpful for all of us. very helpful. pls also inform whether sanskrit-bengaliversion are available? This story is attributed to Bhattoji Dikshita a noted grammarian who was writer of Siddhanta-kaumudi. When he could not find his items he uttered the following verse: गतानुगतिको लोको ना लोकः पारमार्थिकः. वालुकापिंडमात्रेन गतं मे ताम्रभाजनम the meaning is people follow another and do not find the truth. I lost my copper vessel because I hid it under a a heap of sand. can i get the details of the instance where sammohini drug was used .